Every winter, just before the end of term, the pupils of St. John’s School gather round the Glastonbury Thorn that stands in the churchyard and sing carols, including one especially written for the occasion. The oldest pupil has the privilege of cutting a sprig of the Thorn which is then taken to London and presented to the Queen, where it resides on her Christmas Day breakfast table. The presenting of the Thorn to the reigning monarch maintains an old tradition initiated by James Montague, bishop of Bath and Wells, when he sent a branch to Queen Anne, consort of James I (1566 – 1625). In 1951 a direct descendant of the original was planted on the top of Wearyall Hill to commemorate the Festival of Britain. However, it didn’t take and was quietly replaced at the stroke of midnight as the year turned to 1952. This tree became the iconic Glastonbury Holy Thorn of recent times. However, it was vandalised with a chain saw during the night on 8th December 2010 and reduced to nothing but a stump. Shock waves rippled around the world at the attack and Glastonbury Abbey was asked to safeguard the branches on behalf of the community. Conflicting advice was being given as to whether or not it was the right time of year for cuttings to be taken. 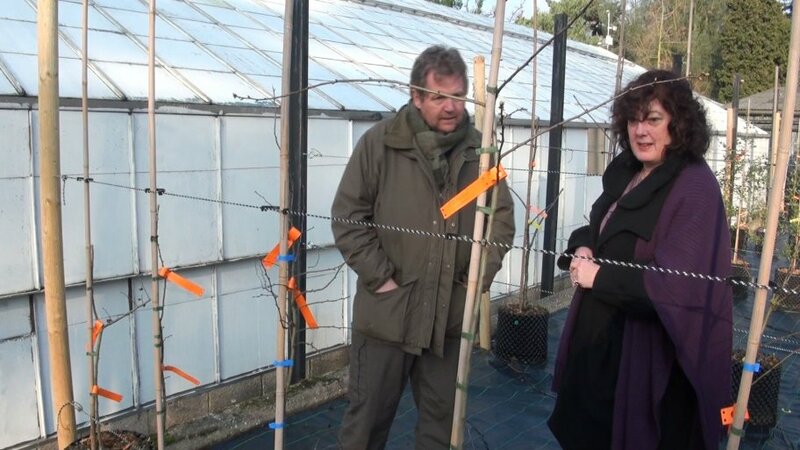 When Tony Kirkham, Head of the Arboretum at the Royal Botanic Gardens at Kew offered his expertise, Morgana West, manager at Glastonbury Pilgrim Reception Centre took the opportunity to consult one of the world’s leading experts on trees. Despite the severe snow and hazardous road conditions, Tony and his Head of Nursery, Tony Hall, travelled from London on a flying visit to Glastonbury. They returned to Kew with several scions and grafted them onto hawthorn rootstock so that new Glastonbury Thorns could be grown from the severed branches on behalf of the community. 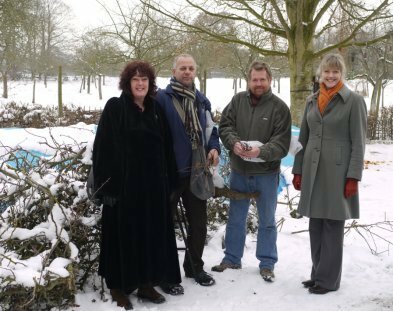 (L-R) Morgana West, Tony Hall, Tony & Katherine Gorbings collecting cuttings from the severed branches. On the 1st April 2012, working with Glastonbury Conservation Society, the landowners of Wearyall Hill planted a new Glastonbury Thorn close to the vicinity of the old one. The sapling was not one of the young ones being nurtured at Kew and came from a nursery in Devon, their parent tree having come from Glastonbury Abbey via Oxford Botanic Garden. Revd. David McGeoch, Vicar of Glastonbury, gave a blessing, linking the young tree to its past and thus creating a new Holy Thorn. However, fifteen days later, this one too was destroyed, the stem has being snapped off about 18 inches from the ground. Tony Kirkham and assistant Andrew demonstrating the intricacies of the grafting process. The young sapling was brought back to Glastonbury, ready for planting in the heart of the town alongside a World Peace Pole in a community event on 26th January 2013. Morgana felt that by placing one alongside a new Glastonbury Thorn, a strong message of Peace and Unity through Diversity would be conveyed to the town and its visitors. Sadly though, on the 14th June 2013 it was discovered that this tree had also been vandalised, being part cut then snapped off. A second Glastonbury Thorn, a descendant from the Devonshire nursery and planted in the same area 18 months earlier by Cllr. Bill Knight also suddenly and suspiciously died, despite having looked splendid a couple of weeks earlier. But the story still continues, mature Glastonbury Thorns can be found in locations all around the town and young ones are being planted in private locations.